"The world is receiving us like we have never seen. They have seen the blackness of his character, of his soul." Khizr Khan, the father of a slain Muslim American war hero, on Sunday continued to speak out against Republican presidential nominee Donald Trump and his anti-Muslim bigotry. 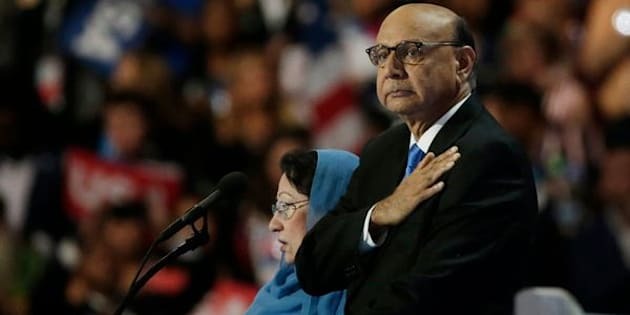 Khan last week delivered an impassioned speech at the Democratic convention in Philadelphia, challenging the Manhattan real estate mogul, who has proposed banning all Muslims from entering the U.S., to read the Constitution. “You have sacrificed nothing and no one,” Khan said. The GOP nominee shot back over the weekend, telling ABC News he has made “a lot of sacrifices.” He also suggested Ghazala Khan wasn’t allowed to speak at the convention. On Sunday, Khan reiterated his belief that Republican leaders like House Speaker Paul Ryan (R-Wis.) and Senate Majority Leader Mitch McConnell (R-Ky.) needed to speak out against Trump. In a separate interview with NBC’s “Meet the Press,” Khan described the outpouring of support he had received around the country ― even from some prominent Republicans. Trump responded to Khan’s earlier comments on Twitter Sunday morning. Both Senate Majority Leader Mitch McConnell (R-Ky.) and House Speaker Paul Ryan (R-Wis.) responded to Khan in statements on Sunday afternoon. They did not, however, mention Trump by name. Later on Sunday, Trump’s running mate, Indiana Gov. Mike Pence (R), attempted to walk back Trump’s comments. ”Donald Trump and I believe that Captain Humayun Khan is an American hero and his family, like all Gold Star families, should be cherished by every American,” he said in a statement. This story was updated with responses from Ryan, McConnell and Pence.